Digital Scrap - Kits There are 10 products. 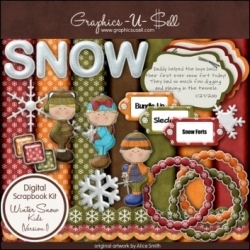 This digital download scrapbook kit includes 7 12x12 (3600x3600) texture effect papers and at least 19 snowflake inspired elements at 300 dpi. Includes transparent PNG and non-transparent JPG formats. The bookplates and journaling tags are blank. Text is shown on the elements for display purposes only. This digital download scrapbook kit includes 8 12x12 (3600x3600) texture effect papers and at least 19 snowflake inspired elements at 300 dpi. Includes transparent PNG and non-transparent JPG formats. The bookplates and journaling tags are blank. Text is shown on the elements for display purposes only. 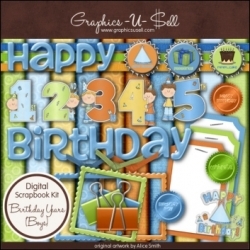 This digital download scrapbook kit includes 10 12x12 (3600x3600) texture effect papers and at least 26 miscellaneous birthday elements at 300 dpi. Includes transparent PNG and non-transparent JPG formats. 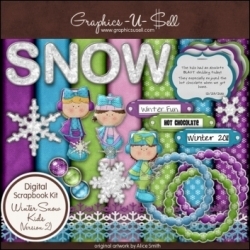 Use a graphics program to put together your own designs using the background papers and digital embellishments. 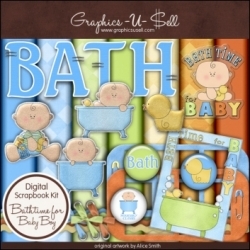 This digital download scrapbook kit includes 7 12x12 (3600x3600) texture effect papers and at least 20 miscellaneous baby bathtime elements at 300 dpi. Includes transparent PNG and non-transparent JPG formats. Use a graphics program to put together your own designs using the background papers and digital embellishments. 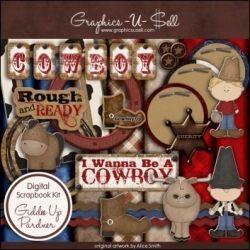 This digital download scrapbook kit includes 7 12x12 (3600x3600) texture effect papers and at least 19 miscellaneous cowboy elements at 300 dpi. Includes transparent PNG and non-transparent JPG formats. Use a graphics program to put together your own designs using the background papers and digital embellishments. This digital download scrapbook kit includes 7 12x12 (3600x3600) texture effect papers and at least 19 miscellaneous school themed elements at 300 dpi. Includes transparent PNG and non-transparent JPG formats. Use a graphics program to put together your own designs using the background papers and digital embellishments.